As I mentioned, this book was my pocket book for quite some time, which explains why the cover looks like it does now compared to how it looked when I bought it in Baraboo in June. As you might know, gentle reader, I’ve been looking to the East like a China Grover the last few years, and I’ve read some books on Buddhism (here, here, and here), Taoism (here, here, and, heaven help me, here). I’ve also read some books on Chinese history (like this) and listened to a long series of lectures on Chinese history (this one). As you know, Confucianism is quite the thing in China and has been historically. So aside from some aphorisms here and there, I have not read Confucius in detail. Although “depth” is misleading. You hear so many aphorisms from Confucius because the collected writings are collections of short lessons and aphorisms that don’t lead from one to another or build upon each other. It’s textually a bit like Marcus Aurelius’s Meditations that way. A bit like the Buddhist lessons, but briefer. Which makes them harder to read in succession because they do tend to repeat themselves thematically. That’s a snarky bit of boiling it way down, but it’s not complicated. Confucius emphasizes filial piety and obedience as the foundation of society. You obey your father and older brothers; they obey the lower ministers; the lower ministers obey the emperor, the Son of Heaven. This then is kind of like the li, the natural way, upon which societies run. The topic and subject of Confucius’s lessons are practical and mostly political and a bit moral. There’s no ontology in there, no real aesthetics. Only that virtue comes from doing the right thing, which is generally following your leader faithfully. It assumes that your leaders are going to be good and wise leaders, superior men, and that the emperor himself will be benevolent, frugal, and wise. Otherwise he won’t be emperor for long, but the lessons do no focus on how to tell if an emperor should be deposed. 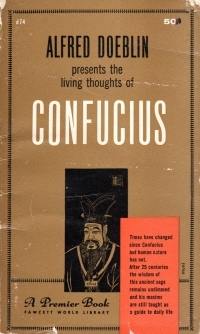 Confucius could be a companion book to Machiavelli’s The Prince. Instead of the focus of how to get and keep power, this book is all about serving those in power because it is morally right. I can see why it might have been a popular philosophy amongst the ruling class of a country. Much like any Chinese history or philosophy book written after 1949, I wonder how much it has been influenced by the modern Chinese government–whether through actual direct involvement in reviewing the material or whether through indirect involvement where the author fears the loss of access to China for further work. This book was first written in 1950, though, so it’s probably indicative of a Chinese mindset that has prevailed through ages. Perhaps I’ll come to a greater understanding of Confucianism versus Buddhism in Chinese thought if I study enough. Have I enough time, I might have something intelligent to say. At any rate, I cannot yet compare this book to other books in Confucian thought. As the aforementioned trip to Baraboo yielded a book on Mencius, I have one more book on Confucianism to read. But based on the content of this one, I’m not inclined to delve more into it. But perhaps I should teach it to my children.